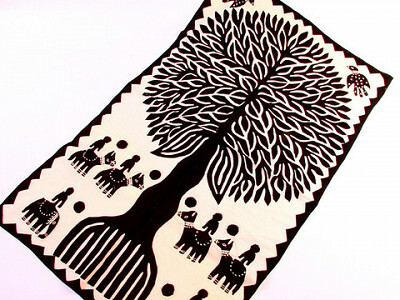 The Tree of Life is a universal symbol, but Indika’s Farinaz told us the unique story behind these cutwork appliqué pieces: In Rajasthan (located in the desert of northern India), a group of women have formed their own cooperative to produce and sell their artwork. Farinaz must travel first by bus and then on foot to reach their village, and she returns every year to see how this work has enabled the women involved to better their lives. Indika’s philosophy is pretty unique, too—they buy what’s offered for sale, never dictating what the western market “needs.” Indika has connected with various organizations or artisans around India that focus on eco-awareness and self-sustainability, as well as focusing on keeping traditional skills alive. The results are beautiful craftsmanship depicting the intrinsic link between humankind and the environment. Each appliqué is cut from a single piece of cloth, hand-stitched by three women over the course of three days to completion. The edges are folded under, pressed and stitched to create a finished piece that’s 24” x 36.” Whether you choose black, red, maroon or yellow on natural, this would be the perfect gift for a baptism, wedding, or even graduation. Good afternoon, Daily Grommet fans! I am so honored to have these beautiful, handmade Wall-Hangings featured on Daily Grommet today. The women who work together to make these pieces of art have earned their way to a better way of life through the revenue these products earn. Three women work for three days to complete each of these wall hangings. Each piece is a timeless expression of the intrinsic link between humankind and our environment. I look forward to reading your comments. We were able to add the maroon/natural color option post video. It is pictured in the product picture above. It's close to cranberry ...a lovely decorating color. 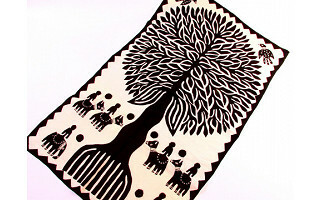 @Farinaz--Are the women who make these wall hangings able to support their families with this work, or is it generally supplemental income for them? The work is gorgeous, BTW. Incredible! I cannot imagine the stamina it would take to finish such a masterpiece. Amazing find! @Lisa - It started out as supplemental income. In time, the money empowered the women to invest in small things, like hens, then goats ... As they earned more, they were able to buy cattle, then even land, which is rare for women in this region to own. Once they were landowners, they earned more respect, which in turn gave them a political voice. Now they make decisions on local government boards about where their drinking water comes from, about sanitation, about how their children are educated. It is truly a wonderful grassroots change that these women have brought about! @Farinaz--what a terrific story you just told, about how these gorgeous crafts can contribute to political voice and real power. Power that directly affects families and their well-being. That's so inspiring. Thank you for your role in all of this. These would make a great bar mitzvah or bat mitzvah commemoration, or gift. A way to celebrate the "Tree of Life" for the boy or girl. @Lisa - Thank you! It's true, how economics affect change on various levels! @Shoshana -- I agree. They make lovely decorations for childrens' rooms! We had one (a maroon one) on our wall when our daughter was little, and we were quite jealous of it, as she would wake up each morning and babble to IT and not to us!! It was very sweet! I told the women about that in India, and they laughed and were very entertained by it! What beautiful gifts these would make for the birth of a new baby, or, as was suggested, a wedding gift. How amazing to see the work women can create while enduring such difficult living conditions. Farinaz - I think it is all about women helping women and your timing is impressive as the latest Oscar's have indicated - America is captivated by India! The wall hangings are beautiful and I also think the prosperity strings are cool.. they would look neat in a play room. Do you sell these too? Wow, this is a wonderful item. Would enhance any room. Great work. As a basket weaver I appreciate all the creativity and hard work that this art involves. We all need to support one another and the potential all women possess! Thanks! Like with basket weaving, the craft is in the fine details! I like to turn the wall hangings over to the reverse side, so I can see all the detailed stitching, all the work done by hand, and not a machine! When I run my hand over the stitching, I feel I'm connecting with the other hand in the village of Barmer that did that work! Marie, I agree with what you said about the quality of work women can create under difficult living conditions. And yet, while they work, they sit together and work in community. They sip tea and gossip as they work, giving each other tremendous support, discussing various issues that affect them all. Their children are around them as they work, so they don't need to send them away or pay for daycare. They work in their own time, when their household chores are done. And they wisely invest their income which empowers them to better the quality of their lives and frees them from debt! Kris, Marie, Audrey, thank you for your appreciative comments. And yes, we do indeed sell the Prosperity Hens, on our Indika Imports website. They are available in an assortment of sizes and lengths. Each has a hand-made goat-bell at the end! Things like this don't usually catch my attention but this is absolutely fascinating. Everything about it......hand made....ancient techniques.....three days to make...one piece of material.....Indian culture...it's all a great story for the whole family to appreciate and learn from. In fact, even in India, we have become so distanced from our own traditional handicrafts. Growing up in urban India, in Bombay, I didn't even know such craft existed in my own country! When batiks and blockprinting from India became popular abroad, mechanisation stepped in to fill in the demand that hand-work couldn't keep up with. The price of machine printed fabric was so fantastic, that the handicrafts were almost all but lost! It is in these rural pockets that the men and women kept up their traditional crafts, keeping a small flame alive. Recently this art and craft has seen a much-needed revival. Spreading the word about this quality of work is what keeps it alive! I appreciate the fine work invested in the Tree of Life and the Prosperity Hens, and the exquisite taste and gracious manner of Farinaz in presenting these lovely items. What beautiful works of art! Indika has connected with various organizations or artisans around India that focus on eco-awareness and self-sustainability, as well as focusing on keeping traditional skills alive. The results are beautiful craftsmanship depicting the intrinsic link between humankind and the environment.